The rise of Maoism as one of the organized political movement in India is the outcome of a historical situation. Both colonialism and the failure of the Indian state to implement land reforms more stringently in the aftermath of independence resulted in terrible sufferings of the marginalized, land- dependent, sections of society. 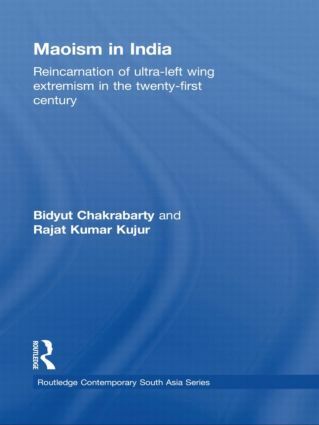 Through historical analysis, this book assesses the ideological articulation of the contemporary ultra-left movement in India, including Maoism which is expanding gradually in India. The author provides answers to the following issues: Is Maoism reflective of the growing disenchantment of the people in the affected areas with the state? Is it a comment on ‘the distorted development planning’ pursued by the Indian state? Is this an outcome of the processes of ‘deepening of democracy’ in India? Using Orissa as a case study, the book raises questions on India’s development strategy. The author argues that Maoism provides critical inputs for an alternative paradigm for development, relevant for ‘transitional societies’ and that it is a still a powerful ideology for the poorer parts of the world although its ideological appeal has declined internationally.